This report synthesized insights from current understanding of drought impacts at stand-to-biogeographic scales, including management options, and we identify challenges to be addressed with new research. Large stand-level shifts underway in western forests already are showing the importance of interactions involving drought, insects, and fire. Diebacks, changes in composition and structure, and shifting range limits are widely observed. 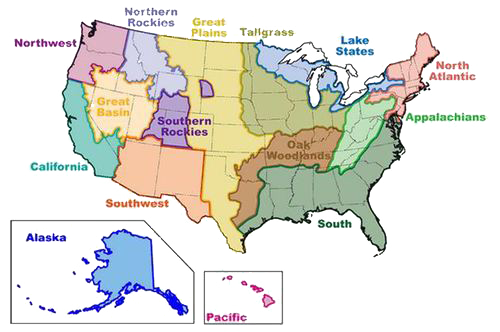 Throughout the continental United States, the combination of projected large climate-induced shifts in suitable habitat from modeling studies and limited potential for the rapid migration of tree populations suggests that changing tree and forest biogeography could substantially lag habitat shifts already underway. Forest management practices can partially ameliorate drought impacts through reductions in stand density, selection of drought-tolerant species and genotypes, artificial regeneration, and the development of multistructured stands. However, silvicultural treatments also could exacerbate drought impacts unless implemented with careful attention to site and stand characteristics. Gaps in our understanding should motivate new research on the effects of interactions involving climate and other species at the stand scale and how interactions and multiple responses are represented in models. This assessment indicates that, without a stronger empirical basis for drought impacts at the stand scale, more complex models may provide limited guidance.